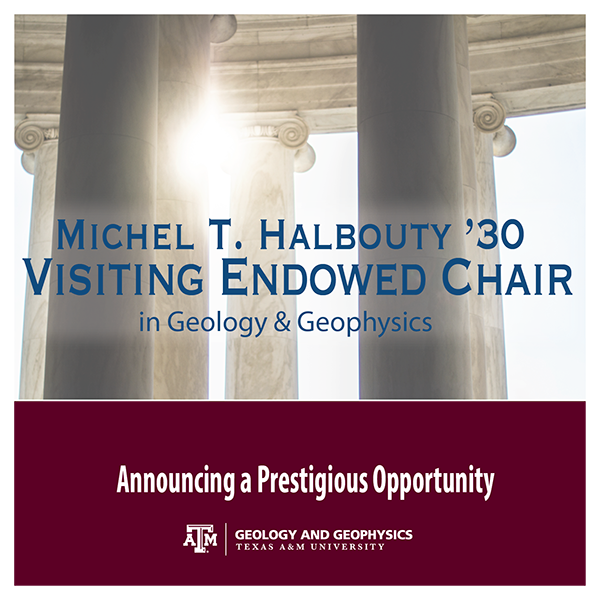 The Department of Geology and Geophysics at Texas A&M University is pleased to announce the Michel T. Halbouty '30 Visiting Chair in Geology and Geophysics. The purpose of Mr. Halbouty's generous gift is to "Promote excellence in the teaching and research of the Department of Geology and Geophysics." We expect to appoint 4 to 5 distinguished scholars to the Visiting Chair over the next few years and provide them the opportunity to visit our campus and interact with department faculty and students for six to twelve months duration. The appointment provides partial salary support and additional funds to cover lodging and travel, as well as proposed engagement activities. Interested persons are encouraged to contact faculty members in the Department of Geology and Geophysics (http://geoweb.tamu.edu/). Applications should identify potential faculty proponents, include a CV, a 2-page proposal identifying engagement activities in teaching and research as a Visiting Chair holder, availability for visiting the department in the upcoming academic year, and tabulation of desired funds needed for salary and other expenses. Texas A&M University is an Affirmative Action/Equal Opportunity Employer committed to excellence through the recruitment and retention of a diverse faculty and student body and compliance with the Americans with Disabilities Act. The University is dedicated to the goal of building a culturally diverse and pluralistic faculty and staff committed to teaching and working in a multicultural environment. We strongly encourage applications from women, underrepresented ethnic groups, veterans, and individuals with disabilities. Texas A&M University also has a policy of being responsive to the needs of dual-career partners (hr.tamu.edu/employment/dual-career.html). Please send your application materials to F.M. Chester, chair of the Halbouty Visiting Chair Committee (chesterf@tamu.edu). For further information, contact F.M. Chester or other faculty members of the department (http://geoweb.tamu.edu).